The dentist will first examine your teeth and gums for good oral health. Then we will discuss the best ways to achieve the results we want in the time frame that you want.Depending on the type of system you decide upon we then schedule to provide you with all the information and timetable for treatment. For home whitening regular visits are arranged for review and with surgery whitening we simply schedule an appointment for you to relax in the chair and watch T.V. or a video of your choice or listen to whatever music you prefer. One hour later its all finished! Is it safe and will it hurt? The procedure is completely safe. 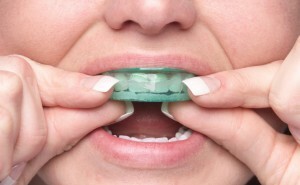 The procedure will not damage enamel or existing fillings. 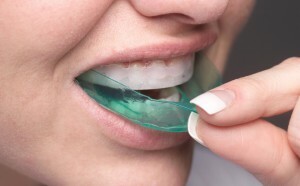 The primary ingredient in all gels is hydrogen peroxide, which has been safely used in teeth whitening for over 100 years and is recognized as an effective whitening product by the dental community. The majority of our clients experience no pain or sensitivity after the Teeth Whitening treatment. A very small percentage of customers may experience a minor dull "ache" following the procedure. Taking some sort of analgesic almost always resolves the feeling. It is best to avoid very hot or very cold drinks for the first 24 hours if there is any tooth sensitivity. How white will my teeth become ? In clinical studies results will vary as your starting point may be different and everyone's teeth respond a little differently, but in virtually all cases, the results are dramatic. Ultimately, the goal will be to achieve your optimum, natural whiteness. During the consultation, our dentist will personally analyze your teeth and provide you with a customized recommendation. Even severe discoloration can be treated to yield great results. However, the more difficult cases can sometimes require a more lengthy treatment than our standard 20 minute treatment. The long-term results depend on the individual. Certain habits, such as the use of tobacco products, drinking a lot of coffee, tea, dark soft drinks, and infrequent visits to the dentist for regular cleanings, can work against the results. Regular professional care and use of the correct oral hygine procedures can help maintain your whiteness for 1-2 years. Some people prefer to repeat whitening treatment more frequently but we will advise you on the best way to optimize long term results. Virtually anyone wanting to whiten his or her teeth can benefit from using including people with severe food, coffee, tobacco or tetracycline stains. Young adults 16 years of age and older are good candidates for the procedure, especially for those that have heavy staining after orthodontic treatment is complete and their appliances are removed. We recommend that you not do this process while nursing or pregnant, receiving orthodontic treatment, or have extensive dental work, such as veneers or crown/bridges. These factors will be reviewed by a dentist at your initial consultation.